I'm already loving my new January block.....a lot! My background this time is a subtle soft blue with polka-dots. I thought it looked like the color of a gray January sky, and snow in the air. This time, I wanted more contrast between the sky and snow. I think it is a perfect background for this winter scene. In appliqué, you always build your block from the background forward. In the majority of the 12 blocks in the quilt, that means you will start with the bias heart. All of the upcoming blocks' hearts will be stitched in a similar manner. This is probably not the way you have been taught to make bias or to stitch stems, etc. in appliqué, but it is the way that really works for me. The key to success with my technique is STARCH, and lots of it. Heavy starch gives the fabric stability, and makes stitching easier. The bias doesn't stretch out of shape, and it will form gentle curves without bumps and pesky 'pokies' along the outer edges. 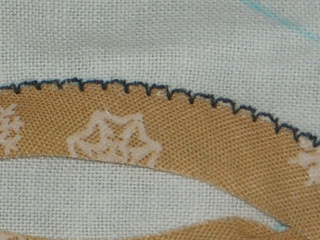 I even use heavy starch when I am appliquing by hand, but it is most important when stitching the bias down by machine. Starch the fabric before cutting the bias, and there will be no fraying, and all strips will be exactly the same width with no waivering. I do not like aerosal spray starch. Liquid starch comes in a half-gallon bottle, is quite inexpensive, and will make a whole gallon of heavy starch. I mix the liquid starch in a 1 to 1 ratio with water (1 cup starch and 1 cup water) in a plant mister bottle, then spritz my fabric and press it dry. Be careful when pressing not to distort or stretch the fabric. Protect your ironing surface with an old terry towel before starching. When this towel is stiff as a board, or soiled, remove it and wash it. The starch comes right out. 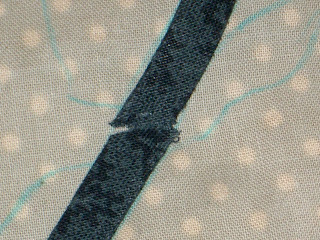 1.To cut 1 14" bias strips from the dark blue Fat Quarter, fold one edge on the diagonal until it is even with the adjacent edge, as shown. 2. 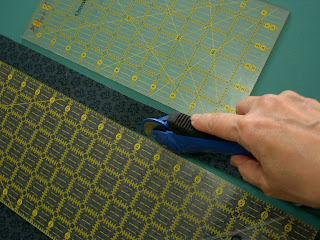 Using a rotary cutter and ruler, cut along and remove the fold. 3. Bring in a second ruler, and measure 1 1/4" from the cut edge. 4. Remove the second ruler, and using the first ruler as your cutting edge, cut two 1 1/4" bias strips from the dark blue Fat Quarter. 1. At the ironing board, fold the bias in half and press. 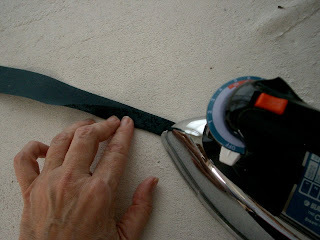 Use a little more spray starch, if necessary, to get a very sharp crease. 1. 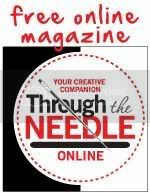 Set your sewing machine for a hem stitch. 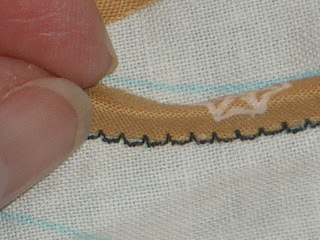 The width of the stitch should be very small: .5 mm on most machines. 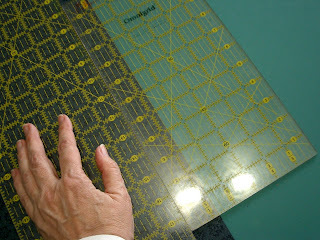 The stitch length should be very short: .5 to .7 mm on most machines. This will take a 'bite' in the appliqué about every 1/8" or so. 2. Thread your machine with nylon invisible thread on top. ( I prefer YLI brand.) Wind a fine thread on the bobbin that will match your bias. 5. As you stitch around the outer corner, do not make a pleat. The pleat will fall on the inside of that corner as you stitch the second side down. 6. As you stitch the inner corner, you will need to form a pleat or fold. It should be deep enough to accommodate the turn. 7. 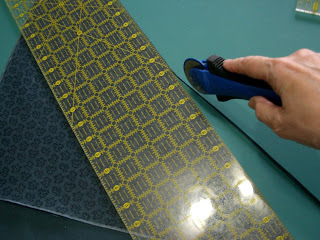 Now, open the bias and trim away the underneath portion of the bias to less than 1/4". 8. 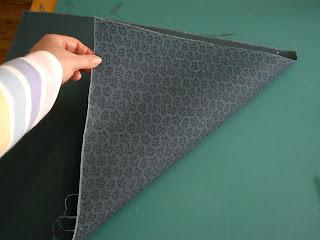 Fold the top layer of the bias under and finger crease, as shown above. 9. 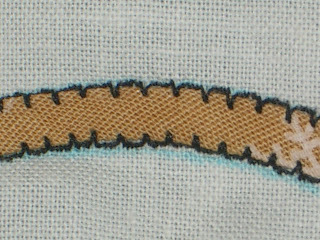 Stitch the remaining side of the bias in a similar manner. 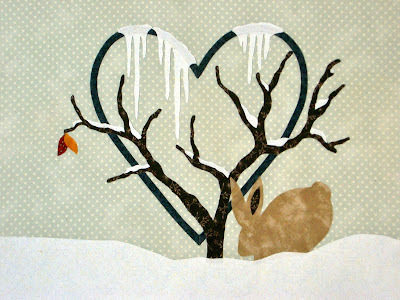 Note: Start stitching the bias at a point where one of the branches of the tree, or icicle appliqués will cover the raw edges. This way, you will not have to seam the two bias pieces together. This technique really works. Folding the bias exactly in half, and trimming later is so much easier than trying to fold, and later control, edges with 1/4" folded under on both sides. So what is a little fabric is wasted? How much is your time worth? And how much is it worth that the bias is a consistent width throughout the piece? I dare you to try it my way, and see what you think. I think you'll like it! Elsie this is a beautiful quilt. Thank you so much for sharing it with us. Reminder: Patterns will be replace on or about the 15th of each month. 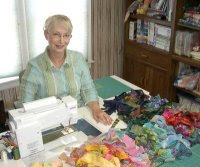 If you miss a month, the entire quilt pattern will be available along with several smaller projects using the block patterns next January,2011. What a delightful project. Thank you so much for sharing your creativity with us. I know I will enjoy working on the quilt throughout the year. You are so generous and caring. Your additonal instructions and helpful information are a perfect compliment for additional learning too. May you continue to improve with that knee too. Thank you so much, Elsie, for this wonderful BOM & for visiting my french blog. I can't resist to start soon this lovely design. Hugs. 4 1/2" "Star Point" unit. The 5 1/4' sq. "A" patches create four 4 1/2" finished units and the 4 1/2" square "B" patches create four 4" square units. No matter what I do, I end up with units that are not equal. What is my problem? To Anonymous: E-mail me privately and we'll see if we can figure this out. I have no way to respond to your request, as I cannot fully answer you here. To Anonymous: I do not have the article in front of me, but the Star Point units are easily trimmed down to 4" square. I'm certain that is what I did, actually, and I'm certain I said to do that in the pattern I sent in to the magazines. I did NOT get to approve their edited version before it went to press, and they rewrote it entirely to fit their format. Anyway, did it say the block was 10 1/2" finished, 12" finished, or what? 5 1/4" squares should yield 4 1/2" UNfinished squares that should finish to 4". Please let me know how you get along.